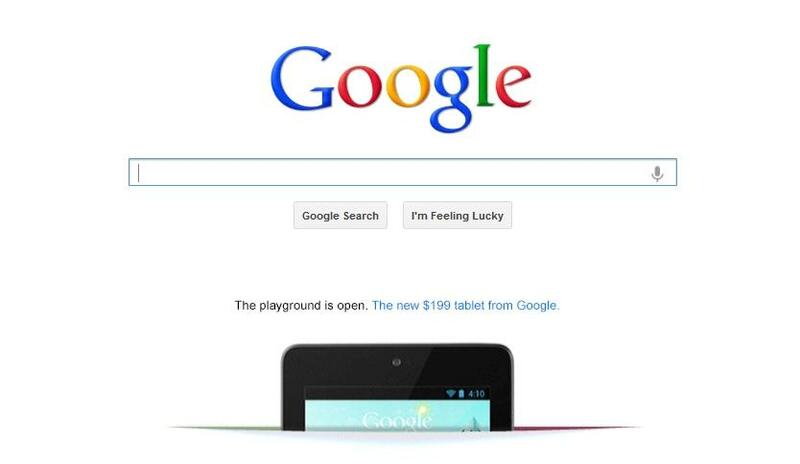 Google advertises Nexus 7 on homepage — why now? It feels a bit odd to write a story about a simple advertisement. But this is just a bit too odd to ignore: Google has, for the first time, decided to promote its Nexus 7 tablet on the Google.com homepage. This is strange for a number of reasons. First and foremost, Google has mostly shunned advertising from the clean whiteness of its search homepage. The company has never, to the best of my knowledge, ever allowed a stand-alone ad from a disconnected third-party to appear there. There have, however, been a few exceptions for its own devices. Most notably, Google broke its no-ad rule in 2010 by publishing a small ad for the Nexus One and the Motorola Droid for Verizon. Okay, so perhaps the Nexus ad’s appearance isn’t that weird. But it begs another question: Why now? Surely Google knows that the technology blogosphere will take notice when it makes a move like this one. And if they know that, then there is good reason to believe they timed this push for the Nexus 7 with certain intentions in mind. Are they trying to squeeze out as many sales as possible before Amazon’s big event next week, during which it is expected to unveil the Kindle Fire 2, the Nexus 7’s closest rival? If I had to bet on it, that’s where I’d place my money. It is entirely possible, of course, that the timing of this conspicuous ad has nothing to do with anything outside Google’s pre-ordained marketing push. The company has had strong success in recent weeks with its Nexus 7 television ads. Perhaps its simply attempting to ride that success out as long as possible. I have reached out to Google to try to get some more information, simply because I’m curious. What’s behind the decision to run this ad, and why now? I will update when (read: if) I receive a response.